Google has a brand-new website for content policy on the Play Store that it unveiled today, and that's nice, but nestled away in that news was a far more interesting story regarding ad blockers. Google has long enforced a de facto ban on ad blockers on the Play Store, citing section 4.4 of the Google Play Developer Distribution Agreement, going all the way back to 2013. This involved a rather convoluted interpretation of a vague policy forbidding apps from interfering with third-party apps or services, but it's the official justification Google has used to date. Now, a new update to the Play Store Developer Policy Center (formerly Google Play Developer Program Policies) makes it clear via an example interpretation of said policy: no ad blockers. To be clear, this does not mark a change in policy as far as we know. It is merely the first time Google has directly acknowledged in its content policy document for the Play Store that ad blockers violate Play Store policy. Previously, if you were an ad blocker you'd just get an email pointing to section 4.4 of the old distribution agreement and pretty much nothing else. The implication was clear, but that Google never came out and said directly "ad blockers are against Play Store policy" led some to believe that maybe the policy was being misinterpreted or, perhaps, was still subject to change. Today's update to the Developer Policy Center seems to finally make clear that Google is taking a stand on ad blockers. Well, except the most popular kind: in-browser ad blockers. Yep, Google still allows browsers with ad blocking, and even plugins for browsers that add ad blocking, on the Play Store. Brave Browser, Firefox (via plugin), Adblock Browser, and Adblock Fast for the Samsung TouchWiz browsers are all still on the Play Store right now, and have been for quite some time. So, Google doesn't allow ad blockers, but apps that block ads inside themselves - like a browser - seem to be OK? The wording of Google's example in the new policy about blocking ads would seem to provide support to that position. "Apps that block or interfere with another app displaying ads." Why not just say "apps that block or interfere with the display of ads?" And I think therein lies Google's dirty little secret: ad blocking is OK... as long as it only occurs inside your own app. Google knows that ad-blocking browsers are popular enough that not having them on Android could hurt the platform. Indeed, iOS 9 received scores of headlines when news that Apple was supporting Safari ad blockers broke, and that put Google, a company funded almost exclusively by web ads, in a very awkward spot. If Google took a hard stance and banned any browser that blocked ads on the Play Store, not only would they be providing Apple ample marketing ammunition, they'd also be fighting a largely futile battle. With sideloading apps being so easy on Android, pushing users who desire a very understandable feature - ad-free web browsing - to non-Play Store channels to get such an app has very visible downsides. What if it sends more people to the Amazon Appstore? What if it results in increased malware installs on Android? 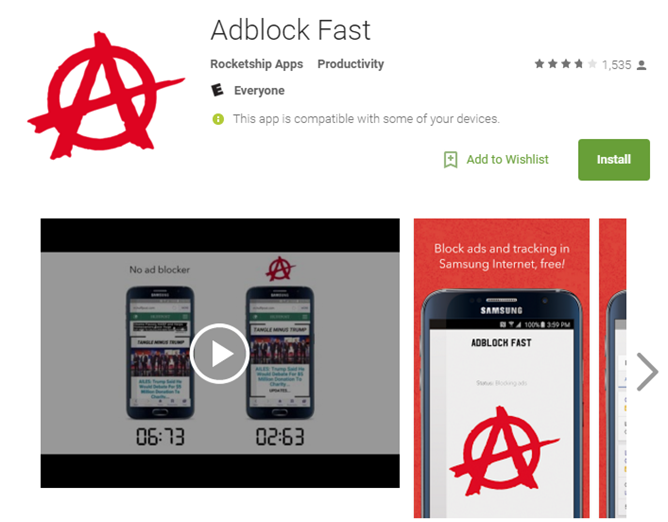 Better to have people getting their ad-blocking browsers from the Play Store than elsewhere. System-wide ad blockers, by contrast, generally require control over things like setting connection proxies, and Google effectively killed Android's most popular ad blocker via a security fix that disabled automatic proxy configuration way back in Jelly Bean 4.2. And Apple, of course, doesn't allow system-wide ad blocking, either, so there's no iOS peer pressure there. The new policy site also features a number of other updates, most of them oriented around developers not being jerks to the users of their apps. Specifically, the following policies are new or updated. Ads associated with your app must not interfere with other apps, ads, or the operation of the device, including system or device buttons and ports. This includes overlays, companion functionality, or widgetized ad units. Ads must only be displayed within the app serving them. Specifically disallowed: Ads that display outside of the app serving them, Ads that are triggered by the home button or other features explicitly designed for exiting the app. All in all, positive changes. And a continued awkward and unstated gray area of permitted existence for ad blocking browsers.